Looking for Scentsy Diffuser and Oil Information? Click Here. Q. What material is used to make Scentsy Warmers? Where are Scentsy Warmers created? Every Scentsy Warmer is made of high-quality ceramic or porcelain. Scentsy warmers are designed by Scentsy Family and made in facilities in China. 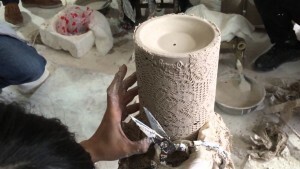 China is one of the best in the world at ceramic manufacturing. Q. What is a Scentsy Wax Bar? What is Scentsy wax made of? Q. Does Scentsy wax contain phthalates? No. Scentsy products are made with fragrance oils that do not contain phthalates. Q. How often should I change the wax? How do I clean the wax out of the Scentsy Warmer? Change your Scentsy wax once the scent is gone. Usually this is every 3-4 days if your are using one cube at a time. The wax itself will never evaporate so once the scent is gone you’ll need to change the wax. While the wax is melted, pour into a disposable container or into its original packaging and wipe the warmer dish with a paper towel or napkin. If the wax is still fragrant and you wish to reuse it, pour the wax into its original packaging and store the used bar in a cool pace. Discard wax if fragrance is depleted. Q. Can I use Scentsy Wax in a different warmer or with a tea light candle or vise versa? I don’t recommend it. Scentsy wax is made specifically for the Scentsy Warmers and vise versa. You will not achieve the same long-lasting results or superior scent throw if you use a tea light or other warmer type. If you use any wax other than Scentsy Wax in your Authentic Scentsy Warmer it will void your lifetime guarantee. Q. How much of the Scentsy Bar do I use at one time? That is really up to you. One of the neatest things about Scentsy Bars is that you can control your scent strength. If you prefer a lighter scent then only use one or two cubes at a time. For a stronger scent, use 3-6 cubes at a time. You can adjust your scent to your liking or combine scents to create your own scent recipe. Q. Do the Scentsy Warmers come with a light bulb and where do I find a replacement? Yes, all of the Warmers come with one Scentsy Light Bulb. You can find replacements at home improvement stores or contact me for a bulb. They are $2/each or $5/pack of 3. Q. Can I sell Scentsy? Absolutely! If you are passionate about safe fragrance, contributing to your community and would like to earn money from home as an Independent Scentsy Consultant than I would love to talk to you more. You can sell Scentsy if you live in one of these countries- US, UK, Mexico, Australia, Ireland, Germany or Canada. All you need to do is purchase a Scentsy Starter Kit and sign the consultant agreement. View the Scentsy Starter Kit and learn more on the Scentsy Business. Q. Do Scentsy Warmers have a warranty? Yes, all Scentsy Warmers come with a lifetime replacement warranty for manufacturing defects. If your warmer is damaged during shipping, has a manufacturer defect, or electrical issue, it may be returned, with no limitation in time, to your Independent Scentsy Consultant for repair or replacement. STILL HAVE A QUESTION? CHAT WITH ME ONLINE!